Thank You to everyone who judged the 2017 Karma Cup. We want to make the 2018 edition of The Karma Cup even better! This year the judging period will be three weeks. We need judges who will have time and the ability to accurately judge — no excuses. Judges Kits on SALE NOW! Pick-up is the third week of August. Judge must be able to pick the Judges Kit up in Toronto in person or make special arrangements. NOTE: 19 +Must provide government photo ID to pickup. In 2017 we had over 130 Entries! We expect a similar amount this year. We have also increased our concentrate sample to 0.2g! The Judges Pass includes entry into The Karma Cup Festival all weekend, and free admission to our host lounges for three weeks, during the judging period. The kit also includes some awesome KARMA swag as well as sponsor swag. Some of the Karma swag includes: Large Dab Mat, Rolling Tray, T-Shirt, Rolling Papers, lighter wraps and more. 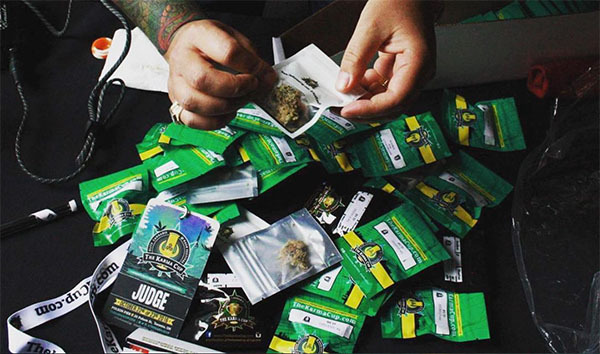 Sponsor swag in the past has included: rolling papers, dab mats, lighters, bud, concentrate, lanyards, posters, t-shirts, seeds, stickers and more. The judges kit is available for purchase now, and will be ready for pick-up the third weekend of August in Toronto. Exact pick-up date and location is confidential, released to paid judges only.